1903 operated under the ownership of A. Alison, Auckland. 1903 sold to Manukau S.S. Company. 1906 Manukau S.S. Company taken over by Northern Steam Ship Company. 1914 replaced on the Waiuku run. Came round to Auckland and ran on Piako run. 1919 sold to McCallum Bros. and renamed KEREPEEHI. Used to tow shingle barges. 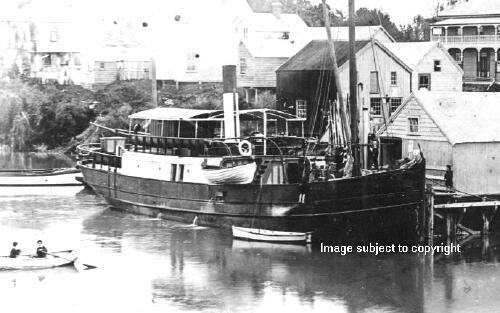 1923 sold to Devonport Steam Ferry Company and renamed KIWI. 1927 sold to Bradney & Binns. 1934 sold to G. Parry, Auckland. 1936 sold to Parry Bros., Auckland. 1940 broken up Auckland and hull buried in waterfront reclamation.